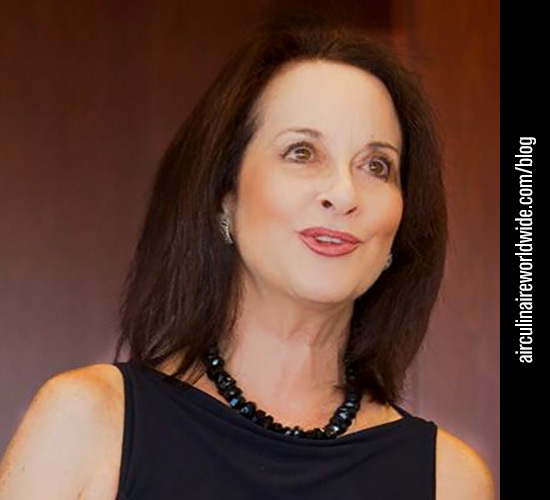 In this week’s corporate flight attendant spotlight, we had the honor of interviewing Susan Friedenberg, who is not only a highly visible member of the business aviation community, but is also an accomplished stand-up comedian. Read along to learn more aboutSusan and her experiences. Hi Susan. Thank you for taking the time to do this interview. First, which aircraft have you flown on during your career? Everything but the Gulfstream 650. Where did you receive flight attendant training? I have trained with Aircare FACTS Training, FlightSafety, Jeff Hare and Medaire. I am a strong believer in cross-training. You can never learn enough from one training vendor! When was your last recurrent? December 2014, FACTS Training in MMU with Lauren Jarmoszko and Frank, the firefighter and medical training teacher. What a GREAT team! What is your base locations? Teterboro, Morristown, Philadelphia, Newark, Wilmington, White Plains, Trenton and Washington, D.C. I am also positioned by flight departments via the commercial airlines globally to commence trips. 45 years! 15 in commercial and 30 in corporate aviation. Have you received any awards or industry scholarships? Yes, I was awarded Woman & Volunteer of the Year in 2011 by Woman in Corporate Aviation. Also, I GIVE scholarships, and I am proud to do so! I want to give back to my beloved industry. I am all about empowering people to have the career I have been blessed with. Any career highlights you would ike to share? I would say the highlight of my aviation career was when Dr. Beau Altman, the founder of Aircare FACTS Training, talked me into creating a training program back in the mid-1990s. I was teaching for quite a few years early on, in the beginning of the NBAA Flight Attendant Committee’s inception at conferences for Break-Out Sessions on how to “Break Into the Industry / Marketing for Business Aviation.” He said that was the missing link and to create a training for it. He said people go to emergency training, leave and can evacuate an aircraft but do not know how to get a flying position post egress training, or DO the job effectively and get called back. I went to Big Sur and sat in a cabin in the Red Woods for a week and put a syllabus together. I then taught my first training class in December 1999. I have to say, I was panicked the first time I taught. My manual, at that time, was 45 pages, it is now 450 pages and weighs 6.5 pounds / 2.9 kilograms. Now I can’t stop talking! Do you have a military background? No, I do not. I think my dad made up for that in my family. He landed in the fourth wave of guys on June 6, 1944 on Omaha Beach (WW2) getting off the boats as a medic and fought for four years for our freedom. Which languages are you fluent in? I would like to say, “I am a fluent English speaker” and that’s about it! Which business aviation conventions and trade shows do you attend? The big NBAA convention every other year and the NBAA Regionals, which I really enjoy. At times, I attend the Schedulers & Dispatchers Conference. I am actually doing two presentations at the one January 2016 in Tampa. What has been your most memorable flight? Flying a Beatle!! It was for me an out-of-body experience! Switching over to food, what types of cuisine do you prefer? Indian, Mexican, German, Japanese, sushi, sashimi, Middle Eastern, Italian, French, Thai, Indonesian, Korean, Cuban, Greek, Hispanic, Soul Food, Vietnamese, African, good American cuisine, Ethiopian, Jamaican, Brazilian, Tex-Mex, Russian, Irish, Spanish, tapas, Polish and Turkish. I LOVE FOOD!! What are your favorite destinations, and why? Italy is my favorite country. The reasons (In no particular order) are due to the great clothes, jewelry, leather, food, wine, olive oil, gorgeous people, Pope Francis, amazing history, geography, magnificent synagogues and churches. The Amalfi Coast is stunningly majestic! Jerusalem is my favorite city; it holds something spiritual and religious for all. Since you call Philadelphia home, what are your favorite restaurants there? The Fork, Rouge, Positano, Laurel, Talulah’s Garden, Osteria and Little Fish. What are some things to do that you would suggest for a corporate flight attendant visiting Philadelphia for the first time? Philadelphia is an amazing place. There is so much early American history here. Constitution Hall, the Liberty Bell, the Constitution Center, a walking tour of the Historic District, the Mural Bus Tour, Betsy Ross’s house, the Philadelphia Museum of Art, Barnes Museum and Reading Terminal (which is across from the Marriott in town and has great places to eat and great take out for catering. Bring packaging and ice packs!). Any cultural tips for a corporate flight attendant visiting Philadelphia for the first time? This is the city of Brotherly Love! It is just a great place. However, like anywhere in these times, do not venture out without pilots after 2100. Also, try a Philly cheese steak. I do not like them, but people stand in line for them. What are some in-flight catering challenges you have experienced? I feel compelled to say something regarding corporate specific aviation caterers. Let’s be honest. There are times when the catering might not be exactly what you “assumed” it would be, or you ordered the wrong thing. Maybe you asked for roasted turkey breast carved off the bone and instead you got deli meat, or you asked for white Belgian asparagus and you got petite green ones, or pitless olives and they had pits. Yet, 99.9 percent of the time they get it spot on, and they do an impeccable job. They have the hardest job in the industry with the constant changes from departure times to passenger count to just about everything. They are the last call when things change and they jump through hoops for us. I think every corporate flight attendant should go to a caterer’s kitchen and spend some time answering the phone calls and taking orders to see how uneducated some of the people placing orders for their flights are and how hard it is for the order takers to get exactly what you want. Caterers do not have a crystal ball! I did that (was an order taker) for a week in Denver for major political event and helped a caterer out of the Denver Jet Center answering phones and taking orders. I was in shock! All I can say is that every trip is a learning experience. No trip or passenger is the same. Read the trip sheet, know your passengers dietary and religious restrictions, and ask questions before departure. I had a trip two years ago with two men from an international country. It was a four-day trip with three legs. The catering, and the other specialized amenities, they wanted were off the wall and I had only one day to get it together. The catering bill was $18,750.00 USD. Getting Beluga Caviar – that was a must on all legs and, at the time, illegal here in the United States, so it was a daunting trip to say the least. All I can say on a comedic note is that I am now an egg smuggler. Can I put that on my CV / resume? What made you decide to become a corporate flight attendant? The last airline I flew for in the mid 1980s, Capitol Air, went bankrupt. I always noticed these cool, outrageous jets while we were taxiing and I knew I wanted to be on them. The moment Capitol shut down, I went to Aircare FACTS Training and started flying. In life, there are things you are just good at and things that you are really bad at. It’s weird, I was good at this from day one. My first trip was on a Falcon 50 with 8 pax from VNY – DCA and they wanted a four-course hot dinner with a small HIGH-LOW oven with four small racks. I pulled it off in a galley the size of a minute, and no space. And I knew I had arrived in DCA literally and figuratively into a new and amazing industry! What do you feel are essential skills for a successful corporate flight attendant? What advice would you give someone looking to become a corporate flight attendant? Vet your training options. This is not an easy industry to break into so you need to be tenacious and do not give up! I look at this as a sales job, you are selling “you.” When a true salesperson hears “No,” that translates into not now, but maybe later. You really need to understand the cabin dynamics involved in this type and venue of flying. It is totally unlike Part 121 (commercial). When you are doing this work, whether full time or contact, it is the passengers’ world not yours. It is a flying office or a family’s personal mode of transportation. “You are a paid guest on the plane,” I can’t stress that enough. Aside from your career in business aviation, do you any special interests? I have always been funny, and a few years ago I started writing things down, putting them in my PC and turning them into comedic bits. My dear friend, Virginia Lippincott, talked me into taking some comedy classes for timing and tightening up my material, so I did. I do open mics at comedy clubs in PHL and even did a show at a casino. I love it! I take imparting training material very seriously. However, my students will all tell you I teach with humor, and that is the way they remember the material. It’s fun to make people laugh. My style is Larry David meets Sara Silverman meets Joan Rivers (RIP Joan!). I also actively speak out against Horse & Carriage Tourism and animal abuse in Philadelphia, and I volunteer for a No-Kill Animal Shelter called Operation Ava. Also, I am in love with my two feline children, Apple and Dakota. Susan, thank you for sharing your insights. What email address should be used to contact you? This article is part of a series of interviews we are conducting with corporate cabin crew members; individuals who are not employed by Air Culinaire Worldwide. If you would like to be considered for an interview, which is posted on our blog and all of our social media accounts, please contact socialmedia@airculinaire.com.